Whaiwhai (log607, 2009-2011) is a series of of locative games designed by the Italian studio log607. It attracted considerable national and international media coverage, winning the Italian award “Primo Premio per l’Innovazione” (First Prize for Innovation) in 2009 and being presented at the Expo 2010 in Shanghai. I have already worked on this subject with Giovanni Caruso, Riccardo Fassone and Mauro Salvador – and we presented a multi-dimensional tool for the analysis of locative apps. In this post, however, I will focus exclusively on Whaiwhai. Whaiwhai – according to the designers, a Maori word that means “to search for” – is a common framework on which different place-specific episodes are built – currently, Whaiwhai experiences are available for the cities of Florence, Rome, Milan, Venice, Verona and New York. Participants engage in a hybrid activity, between a ludic, geo-localized and touristic practice. 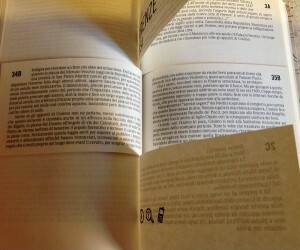 The 2009 version of Whaiwhai was played using a special booklet and an ordinary mobile telephone, exchanging text messages with the game server and reading narrative fragments on the booklet. The current Whaiwhai version is based on an app for the Apple iPhone while keeping the same game-mechanics. From a semiotic perspective, Whaiwhai is constituted by three interwoven components. First of all, Whaiwhai is partly a remediation of traditional travel guides. It motivates players to explore historical areas of specific cities while assigning simple quizzes to be solved by visiting historical landmarks as well as lesser-known areas. Secondly, Whaiwhai makes travel experiences more game-like, offering a set of rules, an objective and a set of quests to solve. The system tracks players throughout their game, offering new challenges as they progress. Also, a rudimentary score system is in place and the game evaluates the players’ progresses. Finally, Whaiwhai blends a fictional narrative with the participants’ explorations. 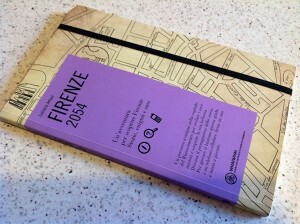 Quests are diegetically inserted into narrative fragments: for instance, the Whaiwhai episode set in Florence is centered on an enciphered diary and on the story of a fictional collector sending the players on a mission to decode it. This product and its usage scenarios are much more closed than other geo-localized apps. While other exemplary cases, such as Foursquare or SCVNGR, enroll their user-base in the co-authorship of the whole experience, Whaiwhai episodes are designed from a single team that does not leave to common users the power to alter the game structure and to add new contents. While its branching structure is remarkably wide and makes it possible for subsequent games to be quite different from one another, it is still a finite experience that cannot be expanded. Also, game-like elements are more prominent in Whaiwhai than in other canonical location-based applications like Foursquare. Sessions have definite beginnings, developments and endings, there is a rudimentary score system and the game evaluates the players’ progresses. While the system is not designed to allow users to lose a game – the story and the session will progress anyway even if the wrong answers are repeatedly given – it still signals whether players are performing in a good or bad way. Although it may certainly be possible to witness emergent behaviors during a Whaiwhai game, those are not openly invited by the system due to the closed and unidirectional (top-down) nature of its ludic and narrative components. Both ludic and narrative features are used in Whaiwhai as “factitive devices”. In his semiotic theory on modal verbs, French narratologist A. J. Greimas defines the factitive modality of an object as the potential skill to communicate their directions of use (communicative function) generating precise actions sequences done by the users (operative function). (In Greimas, A. J. 1983. Du sens. 2. Paris: Éditions du Seuil.) Whaiwhai, then, is designed to encourage a specific type of movement in urban areas and it achieves its objective by presenting a narrative (i.e. a sci-fi mystery in the city of Florence – but the genre varies in each episode) and assigning a series of quests to the player. While the narrative itself is mostly diegetic – for example, there are no game-related props or actors actually existing in the city – some specific elements exist both in the fictional and in the real world. Fictional, diegetic characters “ask” the player to go and interact with certain real landmarks, i.e. by counting the number of windows on the north side of a certain historical building, and “listen” to his report. The factitive, persuasive, function of Whaiwhai is effective if users are actually compelled to visit a specific place to solve a riddle and to proceed in the narration. In a sense, Whaiwhai can be seen as a ludicization of an older medium such as the guide book or, on the other hand, as a spatialization of hypertextual media such as a choose-your-own-adventures book. But, from another angle, is an example of the effectiveness of narrative contents in motivating readers to undertake real-world actions.